Liberation of Paris – August, 1944. On August 25, French General Philippe Leclerc entered the free French capital triumphantly. Pockets of German intransigence remained, but Paris was free from German control. Two days earlier, a French armored division had begun advancing on the capital. Members of the Resistance, now called the French Forces of the Interior, proceeded to free all French civilian prisoners in Paris. The Germans were still counterattacking, setting fire to the Grand Palais, which had been taken over by the Resistance, and killing small groups of Resistance fighters as they encountered them in the city. On August 24, another French armored division entered Paris from the south, receiving an effusion of gratitude from French civilians who poured into the streets to greet their heroes—but still, the Germans continued to fire on French fighters from behind barricades, often catching civilians in the crossfire. More than 500 Resistance fighters died in the struggle for Paris, as well as 127 civilians. Once the city was free from German rule, French collaborators were often killed upon capture, without trial. Although Paris was liberated, there was still heavy fighting in the rest of France. Large portions of the country were still occupied after the successful Operation Dragoon in southern France, which extended into the south-western region of the Vosges Mountains from 15 August to 14 September 1944. Fighting went on in Alsace and Lorraine in eastern France during the last months of 1944 until the early months of 1945. The M8 Light Armored car (seen on the picture) was a 6×6 armored car produced by the Ford Motor Company. It was used by the U.S. and British troops in Europe and the Far East until the end of the war. In British service, the M8 was known as the Greyhound. The British Army found it too lightly armored, particularly the hull floor where anti-tank mines could easily penetrate (crews solution was lining the floor of the crew compartment with sandbags). Nevertheless, it had good off-road capabilities and was produced in large numbers. The M8 Greyhound’s excellent mobility made it a great supportive element in the advancing American and British armored columns. The first tanks to enter in Paris were a republic people from spain. Datusky. You should clarify... 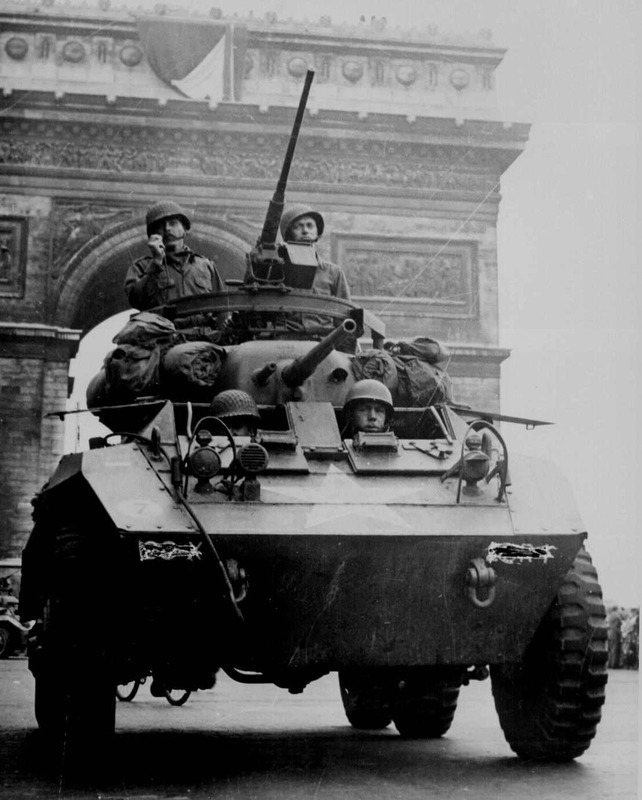 The first tanks to enter Paris were part of French General Leclerc's 2nd armored division. Under the command of Captain Raymond Dronne, a smaller mechanized infantry (tank) unit entered Paris and met up with French resistance fighters who were already organized inside the city. Captain Dronne's tank unit was made up of mostly Spanish Republicans as they were called. This group of Spanish were fighting the regime of Franco and were mostly exiled in France. Since Franco was being supported by the Axis powers and Germany during this time, the Spanish republicans were happy to fight with France. They happened to make up the first "French" unit into Paris for the liberation but it certainly wasn't "Spain" that was involved. the name of the unit was "la Nueve"